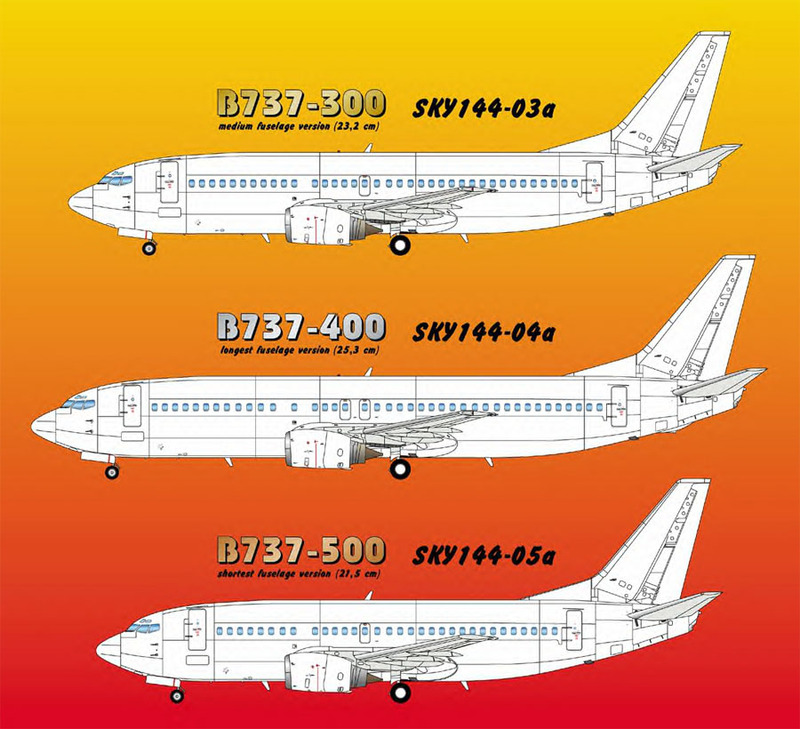 It’s been almost three years since the rumors of a new CAD produced Boeing 737 from Danny Coremans of DACO Products fame surfaced at the hobby shops. Then came the rumblings that it really was in plastic. Out of the blue came another tease, when Danny dropped by the IPMS-USA Nationals in Phoenix in 2004. I was lucky enough to drool over the test shots. What I saw was the most detailed airline kit of all time. It had even surpassed the Revell 737-800 kit. The only thing I asked was, when Danny, when? Enter the holding pattern, again. After promises of showing up in the states at the 2005 IPMS-USA Nationals, the shipping container finally showed up in Europe just in time for the Telford (England) IPMS show. Are they really here, you ask? Yes, they are and how! If you are wondering if this is a re-box of Skyline’s (DACO) earlier B-737-300, no, it’s definitely not. With the older one, you had the option to build a -300, -400 or a -500 by adding plugs or cutting the body. 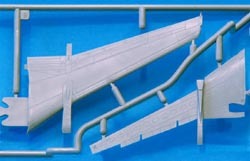 There are three complete kit versions, each with the proper sized fuselage. Also gone is the “sand blasted” surface finish. 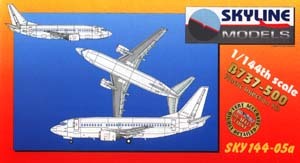 These models come in the same very sturdy crush-proof box, this time with full color art work and five different photos of various parts of the real plane. 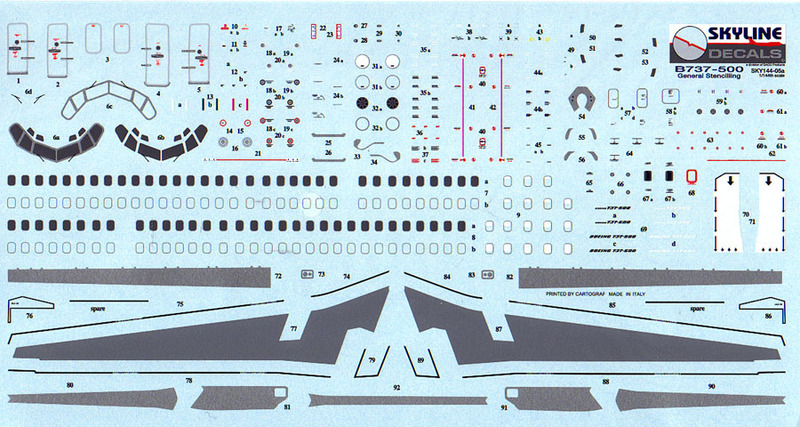 Inside the box you’ll find four sprues of bagged parts, detail decals and an instruction sheet. The fuselage has several points to look at. First, it’s all recessed panel lines. Danny commented to me that every panel and inspection plate on the 737, is on the model. The only raised detail are the rain gutters above the doors and the lightning dispersant strips on the nose. On the real plane these are very thin, maybe only .010 thick, so I doubt you would see these in this scale. Sand them down or off. Some carriers will leave these unpainted, so check your references. The windows are the next interesting item. DACO has tried to please everybody here. You have a choice of smooth body to be decaled or install an additional clear canopy – Minicraft style for a view into your home made cockpit. The side windows can be opened and Clear-Fixed if you want. There is only a very thin skin covering them on the outside. Another nice addition in the body are four tabs to mount your scratch built cabin floor. The rudder is molded as a separate piece, another bonus touch. It’s nice when the manufacture is a modeler also! One of the sour points on the Minicraft 737-300/400 kit is the lack of main gear well detail, better yet, gear well period! Not only do you have a complete boxed in gear well, but one with the correct ribbing on the roof. Main gear struts and wheels are very detailed, as are the gear doors. For some reason the nose gear looks like it came out of a 1/200 Hasegawa airliner kit. What I mean is, it’s just not as detailed as the mains. I’m basing this on Revell’s nose gear, which is good as it gets. I know, you won’t see much when it’s up in the well. Also included are a full package of pitot, nav/com antennas and drain masts in plastic. These are the shinning parts of the kit. The bottom of the wing fits into the top, so as only a small area to putty up will be needed. All the other seams follow the wing slats and flaps panel lines. The recessed detail on the wings is just incredible. 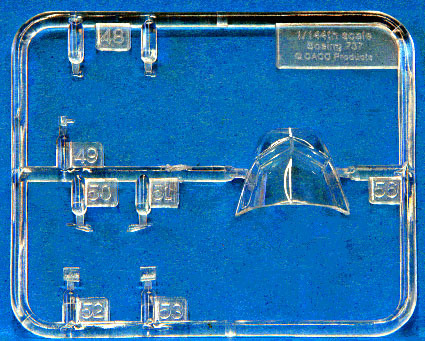 The navigation/strobe light cover is in clear plastic along with the landing light wing covers. An additional bonus with every kit is a set of blended winglets that are the correct shape and size. The wings and stab use a unique locking tab system for a snug fit. The engines consist of seven pieces with a beautiful one piece inlet ring. I hope this becomes the industry standard and we can say someday “…remember when we use to glue inlet halves together?” The shape of the inlet looks just right. 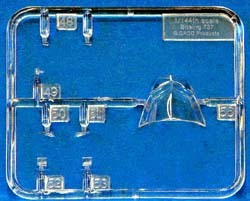 Remember Revell’s too thin 747 inlets? 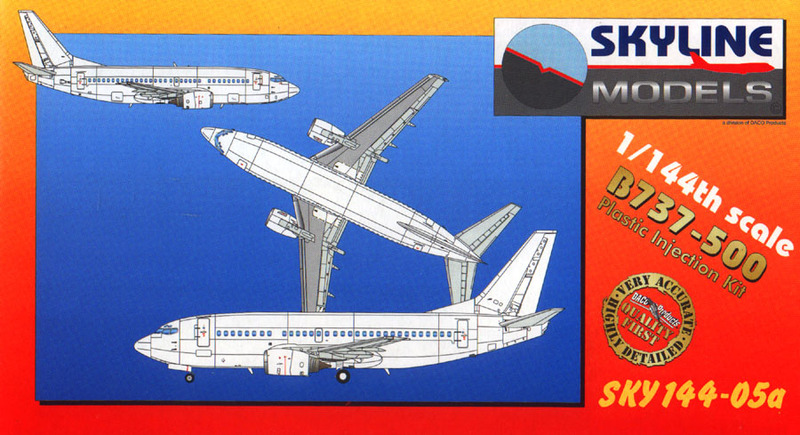 That was my only gripe with the new Minicraft DC-8 kit. The inlet ring is too square and needs a slight sanding to make it right. DACO is following form here again by not including an air carrier paint scheme decal sheet. As with their first kit, only a full, and I mean FULL data sheet is included. Several window, wheel and Corogard options with metal leading edges. Also you have two styles of Boeing 737 scripts, both in black and white. This is a silk screened sheet in perfect registration. Is this the ultimate 737 kit? I think so for now. We are at a turning point for the airline modeler. Here’s a small, one man operation, producing a kit as good or better that a major manufacture, all because of the computer. I can’t wait to see what’s coming in the future. We have just seen the bar being raised here.